So, to get ready for Clogcon, we had a small steamroller tournement at our local gaming club. I decided to play the two lists i probably will play the most at Clog, and went with Xerxis2 and Makeda2. 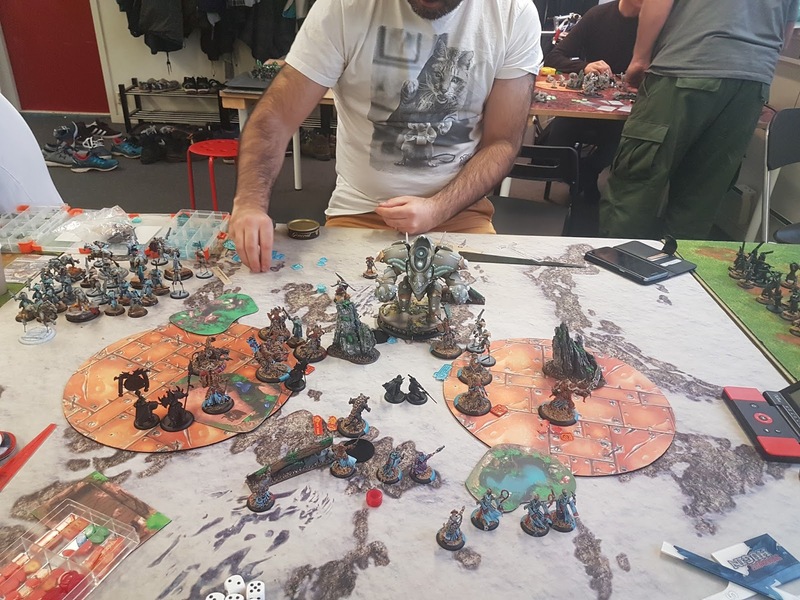 For the first game i got to play against Grymkin. It's not a match up i have been able to play too often, but i have a decent understanding of what they do. 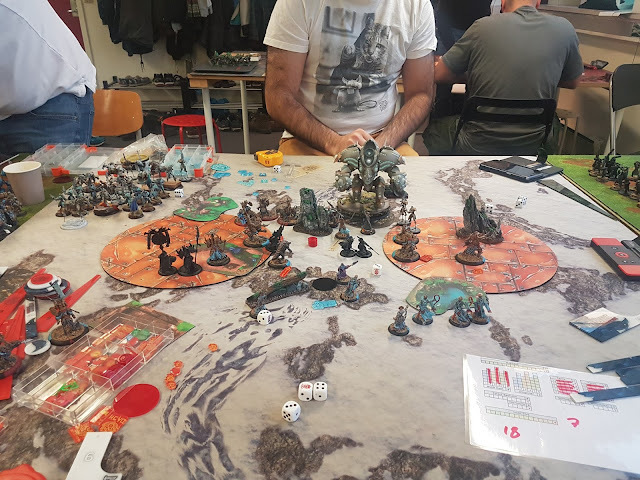 Unfortunately i forgot to take any pictures of that game, but i quickly ended up in a winning position (Dreamer vs. X2) after my opponent played way too passively because he was afraid of my alpha. that allowed me to kill pretty much everything in his list apart from the heavies and BE, while still setting me up in a position where i could easily score, and not be particularly threatened in return. Didn't even need to Feat. For the second game of the day i got drawn against Nima with a Helynna/Kaelyssa pairing. Retribution have always been one of Makedas most favoured matchups, so for me it was really a no-brainer. I got Helynna in return, Game on! I did my usual deployment, Makeda, Legends and Beasts in the centre, with One Ferox, One TyCom, and one Willbreaker on each flank. He mirrored me with Helios and Helynna in the centre with one of each unit on either flank, Lets go! I run everything up in the centre of the board, staying outside of any big threats. I want to claim more boardspace, so i allow him to drag a Ferox or two away from the rest of the pack if he feels like going for that. He realize that he can't just hang back, so he advance a bit, he tries and fails to land a few potshots with the Destors on the Cats, meaning i get to do some dodge shenanigans. The Dawnguard Sentinels both use their Mini-Feat, but curiously, he does not Feat with Helynna, Probably due to wanting a second turn of ARM20 Dawnguard, but doing this makes them much more vulnerable to my full Alpha strike. The position i'm in right now makes me fairly certain that i don't need to go for an assassination. I can get a devastating alpha strike, and set up for a winning scenario play fairly easy. Therefore i decide to use my Feat now, to make sure i hit everything i want to hit. His right (My left) flank is his weakest, due to the blocking obstruction preventing the Helios from shifting over there, so that's where i decide to make my heaviest strike. 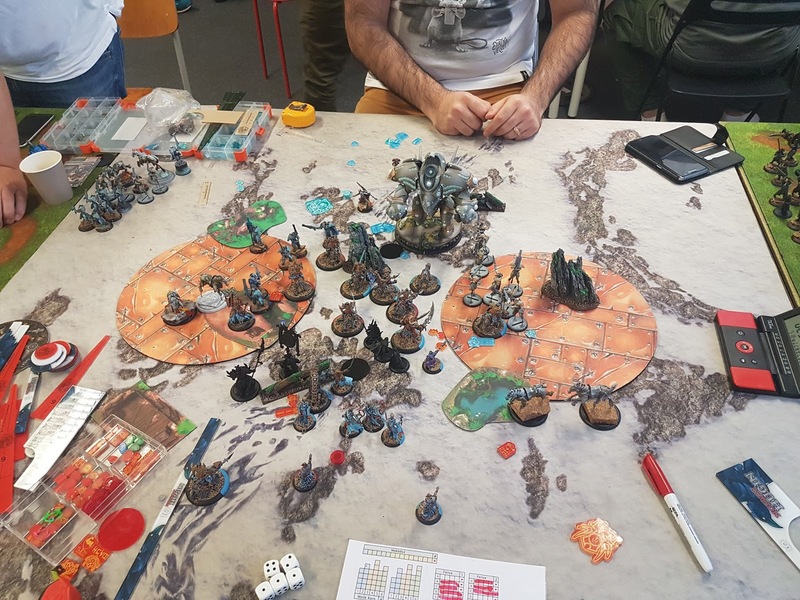 Ferox do their thing, killing most of the guys in the left unit, including the Soulless, and a few guys from the right unit. I shift both Tyrant Commanders over to the left flank, one of them killing the Destor he decided to place in the middle of the zone. 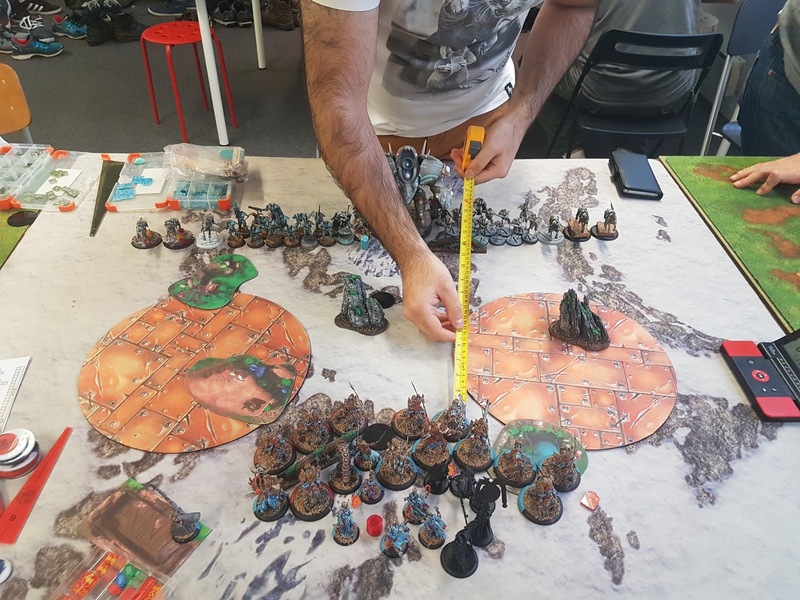 Molik Deals with the Destor he put in the middle of the other zone and Fate Walks to safety. Radheeim kill the Scyir. 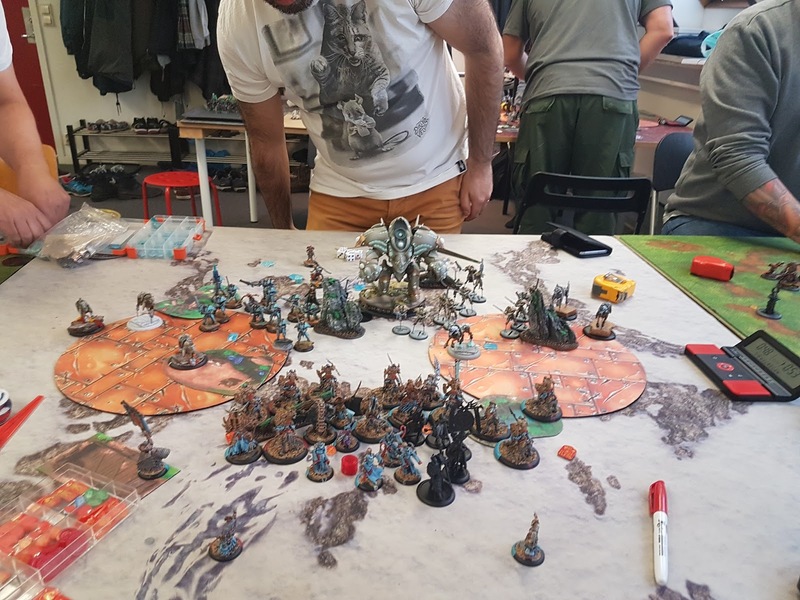 When all is said and done, the Legends can't get to anythig as othing is really left alive near them, so they instead position themselves for next turn, trying to prevent him from contesting my flag if he wants to do that. I reposition the cats to block his Helios from doing anything. He charge in with everything he's got, but some critical misses, and a decent amount of tough rolls only see me lose three cats to his retaliation ( I had two Stay Deaths left, but i let some of the first cats he got to die to keep the more crucial ones alive, like the one blocking his Helios). Helynna Feats, but he doesn't contest my flag as he wants to do as much damage to me as possible instead. I clear the left zone with little difficulty,leaving only one Sentinel outside the zone on my left flank. 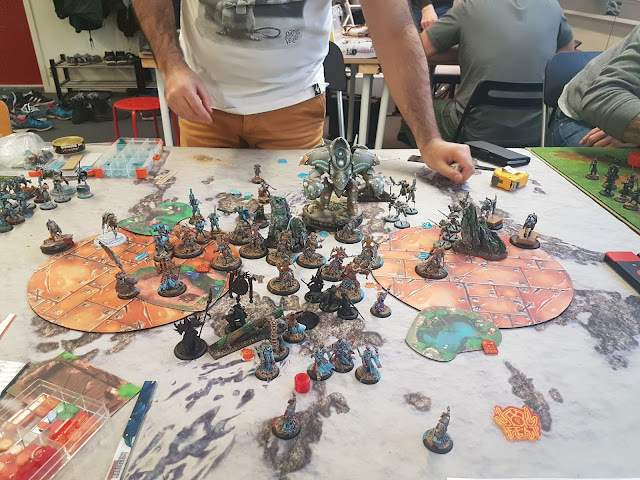 Molik kill the Destors and a couple of Sentinels, while Legends+Ferox deal with all but one Sentinel in the right Zone (alas, not a third point for me this turn.) Forgot to move Makeda away from the flag to a more safe position (Orin could score on my flag instead, i just forgot that he could..) , so i instead try to put other things in the way of Makeda to keep her safe from a potential Last ditch assassination. Seeing as there's not really anything he can do to win this (I'm massively up on attrition, Scenario and Clock), he decides to go for the last ditch assassination. He use a few activations to try and unjam his Helios, i allow him to kill it with Lanyssa eventually, leaving me on 4 Fury. He uses Helynna to move the Krea away from Makeda so that i don't get the Aura, and casts Hand of Destruction on her, meaning the Helios will be able to hit her more easily. He then proceeds to drag me all the way over to himself, with a run of lucky rolls, but his luck runs out there though, as he only manage to hit his initial attacks, then miss with his two bought ones (He used the third focus he had on him to boost his first Drag shot because i had cover from the wall. Since i didn't have a solo on my flag anymore and he had that one last Sentinel to contest the left zone, i didn't score anything this turn. But the game was basically over anyways. All i had to do was to kill that one Sentinel and move a Willbreaker onto the flag. This game turned out pretty much the way i expected it to. Without Vyros og Rahn, Retribution really does not have any good answers to the kitties, and even with those it's still a matchup that favours the kitties. I was a bit surprised when he didn't Feat Bottom of 1, the extra ARM might have limited my alpha enough to let him swing the game a bit into his favour on his follow-up, but in the end, i don't think it would have made that much of a difference. The kitties are still really hard to get through, and even though the game would have become a bit longer and grindier, i'm confident that i would still have enough models left to do what needed to be done in the following turns. I need to get better at keeping Makeda safe, I keep forgetting that High DEF isn't a sure way to keep things alive, luckily, it didn't cost me the game this time. Many online casino games excessively. คาสิโนออนไลน์ Meet the expertise of playing casino games online excessive amount. Who is willing to help player game everyone has been happy with the play are numerous and all its amazing variety to the player and every game you have to play a card game Dragon - Tiger. Online is fully equipped.